Harbortouch is designed to get your business online fast with a robust POS system along with credit card processing – together in one bundled package. The company provides free equipment to its customers, however, you must sign up for a long term credit card processing contract in order to enjoy this equipment. Harbortouch has various customizable systems for different types of businesses, including restaurants and bars, salons, retail outlets and quick serve establishments that deliver food. Small businesses on a budget will appreciate Harbortouch’s affordable plans, starting as low as $39.99 per month. With on-site support for setup, and available training and support services provided, it’s easy to onboard and get your team up to speed in no time. Harbortouch specializes in giving businesses personal attention, making them ideal for those with little experience working with a POS system. 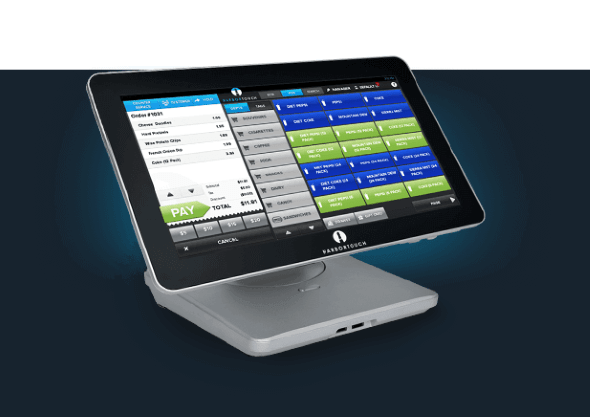 Habortouch offers the simpler and cheaper Harbortouch Echo POS, made for kiosks, food trucks, ice cream shops and cafes, as well as the more advanced Harbortouch Elite POS for larger operations, such as fine dining establishments, nightclubs and salons. This POS system can be integrated with other systems—primarily with options provided by Harbortouch itself—including ECR (electric cash register), NFC (near field communication), EMV terminals (smart chip cards for MasterCard and Visa), printers, and wireless card swipers. They also offer a mobile application called HarborPay, which is a mobile payment option for accepting credit and debit card payments. Harbortouch provides free equipment replacement if hardware breaks down or malfunctions. Harbortouch has various software packages specifically designed for different businesses. Its relatively low cost caters to businesses on a budget. Bars and Restaurants: Harbortouch offers software tailored to restaurants, whether they be fine dining establishments, casual diners or fast food locations. They offer features such as tableside iPad ordering, online ordering, online reservations, flexible pricing to easily make daily changes for specials and discounts, order management, simple menu setup, management of employees, table tracking and bar tabs. Retail: For retail establishments, Harbortouch offers efficient inventory tracking, vendor management and purchase order creation, employee commissions, employee management, customer database capabilities, flexible pricing and a useful attribute matrix, which allows clothing or shoe stores to include variations for size, style and color for a single item. QSR and Delivery: Made to serve restaurants that deliver food, Harbortouch's Elite POS system for delivery and quick service includes features such as a delivery dashboard that keeps track of which delivery drivers are available, advanced mapping functionality, caller ID integration, flexible pricing, employee management and a database to store customer order and personal information. Salons and Spas: This software allows business owners to set and track customer appointments, track employee commissions, sell products and keep a database of customers to track their preferences and even upload photos of their previous styles. 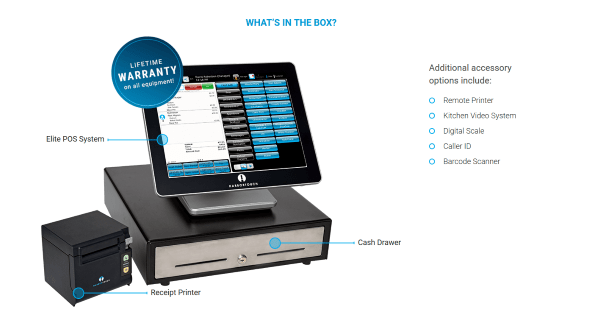 Harbortouch’s POS interface is straightforward and easy-to-use. The customizable menus provide a clear indication of what you’re working with. With the on-site support for setup and available training and support services provided, it’s easy to onboard and get your team up to speed in no time. The menus are simple to navigate, and the backend dashboard for managing your business is fairly streamlined. You won’t ever have to worry about getting lost trying to find some individual metric, piece of data or report function. Customer ease of use is a top priority for Harbortouch as it boasts a staff of certified technicians who are dedicated to providing a superior installation experience. They work around their clients' schedules in order to ensure that business operations are not interrupted. The technicians provide a training overview at the time of installation as well as advanced phone training to ensure that you are able to utilize all of the functions that your POS system offers. Those who prefer to simplify their operation, or believe they have no use for certain functions, can opt to hide these functions, only displaying the elements of the POS system that they use. Harbortouch provides its own equipment to merchants, which may be seen as a positive or negative, depending on your business needs. The equipment is free, and Harbortouch fixes or replaces it if there are any problems. They hold your hand through the installation and training process, but the trade off is having to sign up for a long term credit card processing contract which incurs a cancellation penalty. There’s no secondary app for installation if you want to utilize your own hardware like an iPad. You’ll need to invest in the Harbortouch POS system. That may be a bit disappointing for some given the number of other POS systems that either integrate specifically with iOS, Android or are fully web-based to allow for use with any system. Harbortouch does offer a degree of integration, primarily with options it provides, including ECR (electronic cash register), NFC (near field communication), EMV terminals (smart chip cards for MasterCard and Visa), printers, and wireless card swipers. There is a mobile application called HarborPay, which is not a complete POS interface, but rather a mobile payment option for accepting credit and debit card payments. arbortouch’s default services provide simple native reporting. If you want the complete spread of analytics and sales metrics you need to pay for the Harbortouch Online premium reporting tool. This gives you 24/7 access to your account information for streamlining the management of your account. It’s designed to integrate with your merchant service account (through Harbortouch) as well as your POS system to run real-time POS reports and make updates to menu/products remotely, via the Harbortouch Lighthouse feature. That’s not to say that the native reporting is limited. You’ll still be able to track employee time and payroll, review sales history and data, financials, inventory tracking, and identify sales trends. Harbortouch support begins on site at your business with their expert installation of equipment and initial face-to-face training for employees. It continues with their follow-up phone training, after which there are a myriad of channels by which you can troubleshoot problems and further your understanding of the POS equipment. 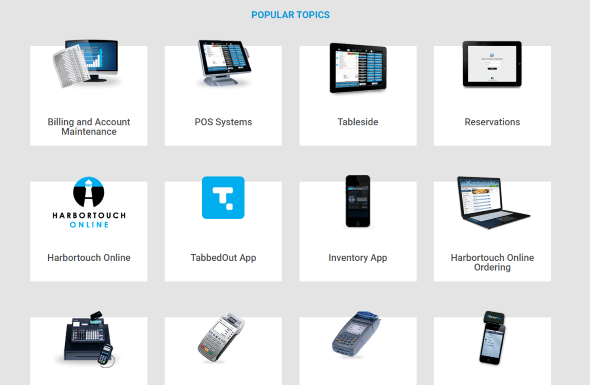 Harbortouch features an extensive knowledge base that is easily navigable by topic. It features equipment manuals and training videos breaking down individual functions step-by-step. The videos are particularly valuable for future employee training. There is also a customer service FAQ section for billing and account questions that merchants might have of Harbortouch. Those who need to contact Harbortouch will find a number for their corporate department, open during business hours, as well as a 24/7 support number that bypasses the directory and routes your call to the support staff for a quicker response. There is also an email support option as well as a live chat option. For full support on Harbortouch’s elite plans, customers will have to pay an extra $20 monthly fee. Harbortouch offers a 30-day trial once you’ve signed up, and will give you a free demo of how its POS system can work with your business if you fill out your basic, non-payment details online. It offers a number of different plans, for different types of businesses. The Payment Systems plan does not include a POS system, but rather just a cash register and card readers. There is no monthly service fee for the plan, but vendors pay a transaction fee for each credit card purchase. The Echo POS system plan is for small businesses such as kiosks, coffee stands and food trucks and has a $39 monthly service fee. The Elite POS System plan, for $69 per month, is designed for bars, restaurants and retail establishments. There is also a special Salon and Spa POS plan for $69 per month. The plans come with free equipment, but you must sign a 3-year credit card processing contract. Harbortouch pushes hard on the free POS system but that option puts you into a contract term with an early termination fee of either $250 or the number of remaining months in the contract multiplied by $35. You may also be subject to a $79 annual fee and $89 security fee. Because Harbortouch does work with independent agents you may find that conditions for the agreement and costs may vary. If you can deal with the credit card processing contract, then Harbotouch can help you get up and running relatively cheaply. Even with the processing agreement, the monthly cost of the POS system is low compared to industry standards, but it also has some limited functionality compared to other, more robust POS systems. If you’re starting out on a budget and need a lot of guidance in installation and training, Harbortouch might be a good fit for your business. Harbortouch has been providing POS systems and payment processing services to restaurants and retail businesses since 1999. Headquartered in Allentown, Pennsylvania, Harbortouch has served over 300,000 merchants and processes more than $12 billion in payments a year. The company has annual revenues of more than $300 million and employs over 400 people.